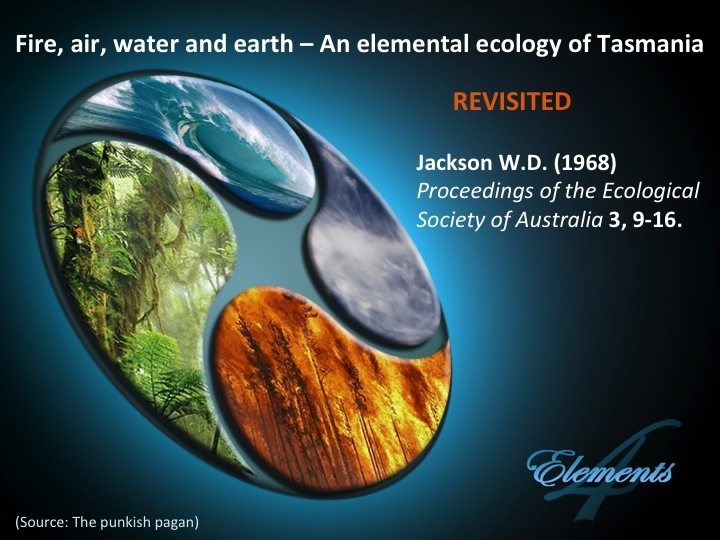 ‘Elemental ecology’ was coined in 1968 by Professor Bill Jackson, a Tasmanian academic. It was captured for prosperity in his scientific publication ‘Fire, air, water and earth – An elemental ecology of Tasmania.’ This time last year I was preparing a spoken paper for the Ecological Society of Australia (ESA) conference that would revisit Bill’s concept. My first post on elemental ecology was written before the presentation, this one provides an update 12 months on. The simplest way to tell this story is through some of the slides I used in the ESA presentation. Where relevant, some additional text will be provided after and in-between the images. 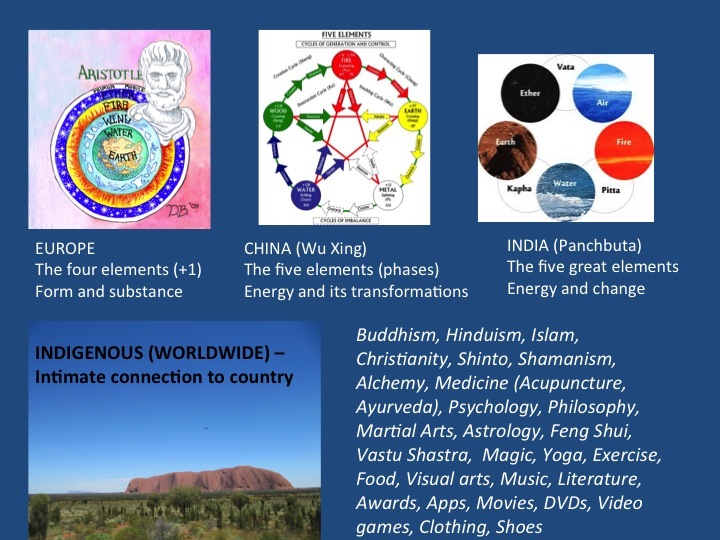 The introductory slide to the presentation used a striking image I found on the internet to reinforce the focus on the four elements of fire, air, water and earth in Jackson’s 1968 paper. Ot at least in the title. In the main text, Jackson develops a theoretical model that aims to explain vegetation dynamics as they are influenced by soil type, climate and fire frequency. Although these could have been related to earth, water and fire respectively, and used to explore elemental ecology further, this opportunity was not acted on. As with any presentation, it is important to set the scene. The principal elemental frameworks and breadth of regions and subjects where the elements are expressed was described. The characterisation of the elements as energy and its transformation is a common theme. While not illustrated, Japan draws on both Chinese and Indian frameworks, the latter through the influence of Buddhism. The elements are strongly embedded in other religions, belief systems and healing practices. These are just the tip of the ice-berg. I was aware that there could be some scepticism in the audience about the relevance of the intuitive elements to ecology. Unlike the discipline of architecture, the elements are generally not considered seriously amongst the environmental science community. This is interesting as my colleagues who work on fire ecology, soil science, water management and climate change are all working on the elements. In the west however our training does not address these alternative perspectives and frameworks. David Suzuki is one scientist who is not a sceptic. He has written and spoken extensively on the elements as a framework to reconnect people with nature. His strong connections with indigenous people informs and underpins this approach. E.O Wilson was given as another example in my presentation of a respected scientist whose written work is relevant to elemental ecology. Through the Biophilia hypothesis Wilson states that our existence depends on the connections that humans sub-consciously seek with the rest of life. My proposition was, and is, that the elements are also a part of the collective unconscious that incorporates patterns of memories, instincts, and experiences common to all human kind . 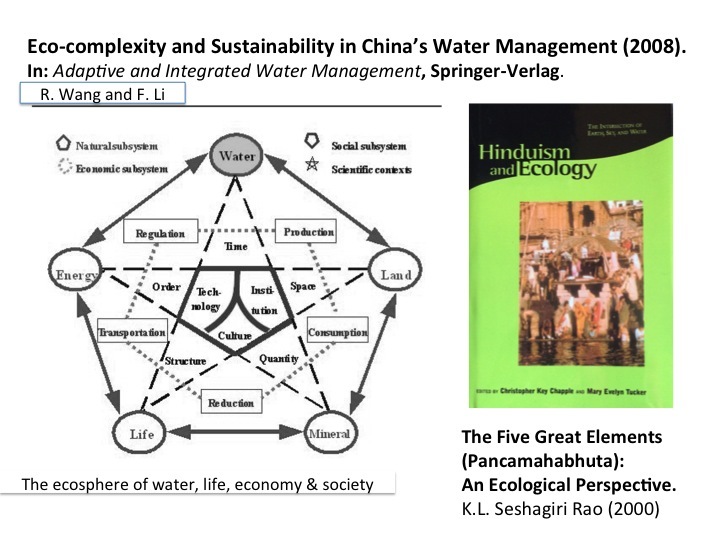 Two examples from China (left diagram) and India (right) were used in the presentation to demonstrate where the elements have been used in an ecological context. The two philosophies (Wu Xing and Praktri) these publications draw on are thousands of years old. The book ‘Hinduism and Ecology. The Intersection of Earth, Sky and Water‘ contains a wealth of material on issues such as forest ecology, river management, air quality and environmental restoration. References to the elements of earth, water, fire and air abound in Hindu texts providing a framework to examine past and future environmental management. The penultimate slide in the ESA presentation addressed what elemental ecology could look like. These characteristics are ones that I have identified at a broad level. More thought and discussion is required to flesh out and add details to this preliminary list. I have also seen reference to elemental ecology in the field of eco-psychology. This could be an avenue worth exploring when developing the concept further. So how did my colleagues respond to the presentation? Some were somewhat surprised with the content. Based on my expertise and previous conference presentations they were expecting a standard talk on fire ecology and native vegetation dynamics. It is good at times to present ideas that go beyond people’s expectations. Professor Jackson’s paper generated considerable debate when it was published. Revisiting elemental ecology also got people talking. On taking questions after I’d finished, one scientist asked how species would be treated by elemental ecology. That’s a good question. Potentially they would be treated the same as they are now in the way they are classified and described. They would however sit within a different framework. 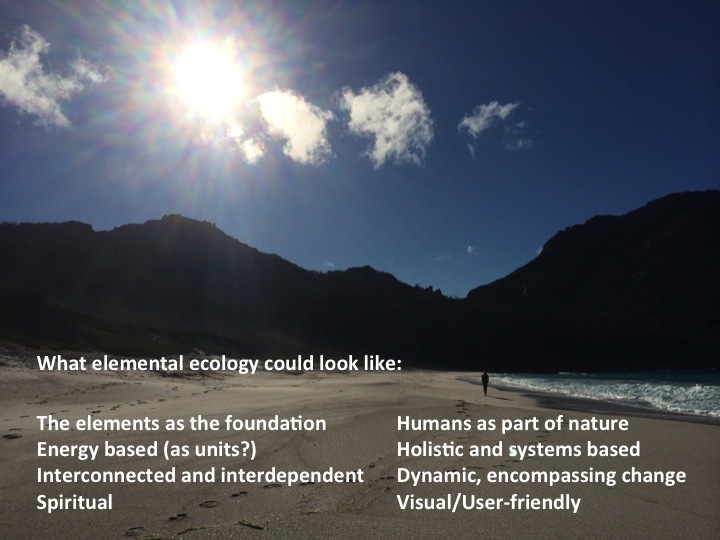 It would be great to brainstorm these and other ideas that ‘elemental ecology’ brings to mind. Another scientist in the audience remarked how marketers used the elements to influence what people buy and what they do. That’s true. The interesting question is why do they do it? Because the elements are fundamental building blocks of life which we respond to both consciously and sub-conciously. This connection can also be used to bring people closer to nature. That is one of the reasons for writing this blog. This entry was posted in Air, Australia, Books & reviews, China, Earth, Europe, Fire, India, Indigenous knowledge, Japan, Philosophy, Popular culture, Visual Arts, Water and tagged Air, China, David Suzuki, earth, Elemental ecology, Energy, Fire, Hinduism, India, Water, Wu Xing. Bookmark the permalink. Great piece Jann, Like how you validate each point and also point to questions they could raise. Yay!! Thanks Rod. I’m hoping that this post will generate more discussion and debate about what elemental ecology could look like. The idea of using the elements as an archetype and building block for ecological policy is an intriguing new idea to me… Looks like it has a lot of mileage. Nice piece! Thanks John. It does have some potential I believe. There is increasing attention being paid by the scientific community to individual elements, like the work by Wallace J. Nicholls on water and neuroconservation (which I’ve written a post about). The historian Stephen J. Pyne has written about fire as ‘the element that isn’t’ (which I’m going to write a post about!). Bringing the elements together in an overarching framework would take it to another level. There is a lot to be learnt from eastern and indigenous belief systems. One of the limiting factors in sharing our different perspectives, including for me, is only being able to read and speak in english.